Top 7 SEO Mistakes to avoid in Magento: #1 Robot.txt file – is this on? Our next eLearning series is geared to Magento eCommerce store owners. In it, we`re going to cover the Top 10 SEO Mistakes to Avoid with Magento. Why? As I`m sure most of you know, it`s not enough to simply build a website and hope for sales. You need a strategy to drive traffic from search marketing. We work in and around the Magento system every day, and this is a list of top mistakes to avoid. We`d love to help out with your search marketing needs – please email me back if you`d like to discuss. If search engines can`t index your site, what`s a website worth? By default, Magento often adds in a robot.txt file onto your site to prevent search engines from indexing your site. This is done so that when you are developing a site (and don`t have real prices or products), your site won`t show up in Google`s search results. We`ve had several cases where this is set incorrectly in the Magento Admin after the site is launched. It`s a really minor thing, but to a search engine like Bing, Google or Yahoo, this file basically tells search engines to go away and not pay attention to your store. … so that search engines will continue to index your site. To check or update your Magento store`s Robot settings you can go to your Magento Admin Panel, then to System -> Configuration. On the left side click on the Design tab and scroll down until you see the “Default Robots” setting. 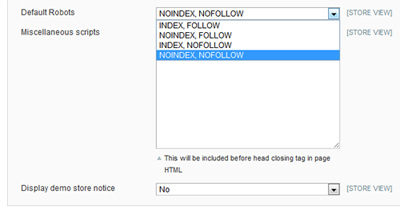 Make sure your live or production site is set to “INDEX, FOLLOW” while any of your development or testing sites are set to “NOINDEX, NOFOLLOW”. Let me know if you`d like me to check on this for you for your site. It`s a common mistake, that often results in poor performance.